If your video surveillance system is a few years old, chances are that it is an analog system running over an infrastructure of coaxial cables. Even though it has become a generic term, what you have is truly CCTV. 1. I wish my cameras had more resolution. 2. Maybe I should get an IP video surveillance system. Your investment in a video surveillance system is a significant cost. It could be that you spent as much for the coaxial cables as you did for the recorder and cameras (or more). Wouldn’t it be great to discover hidden ROI in your system? You can. And it might be easier than your think. Today, you have the option for HD video over coax (HD over Coax™) — up to 5MP resolution and higher is coming. HDoC™ cameras and recorders take advantage of your existing coaxial cable infrastructure by adding high resolution cameras and swapping your recorder for a new one that supports all your analog cameras. 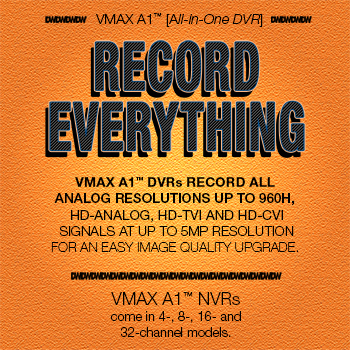 A DW® VMAX® A1™ DVR will record all of your existing analog cameras and HD analog cameras up to 5MP. These recorders are Universal HD over Coax®, meaning that they accommodate HD-Analog, HD-TVI and HD-CVI signals. When you need to expand your system, now you know that you can add HD cameras (as long as you swap your recorder). What if you want to keep your analog system while you add an IP system? You can. It’s called a hybrid system. You can use an encoder to bring your analog cameras into an IP system. For example, a DW® Compressor™ HD Analog to IP Encoder makes it easy to view and record your analog cameras in DW Spectrum™ IPVMS. You will see all of your cameras — analog and IP — in a single user interface. View the hybrid system with the DW Spectrum® client software on your desktop computer, with DW Cloud™ on any web browser and on the DW Spectrum™ Mobile app for iOS® and Android®. You can even bring up the system on your Apple TV with the DW Site Viewer™ app. 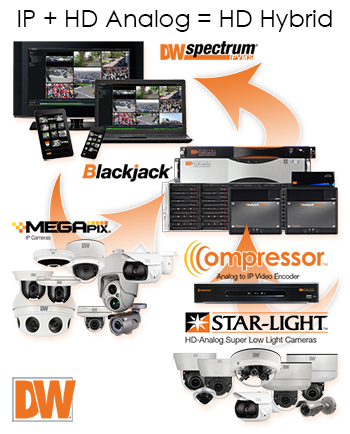 Please consider asking your professional integrator about DW® HD over Coax™ cameras, recorders and encoders.